The following are photos from Barry Watson. They feature his fishing family relatives and their story. Picture above: This is a photograph of my grandfather Henry Watson. He started his career in Hull as a stoker on trawlers, later becoming a trawler engineer. Around 1910 he moved to Scarborough with his family, living at 10 Castlegate, and later Princess Street. 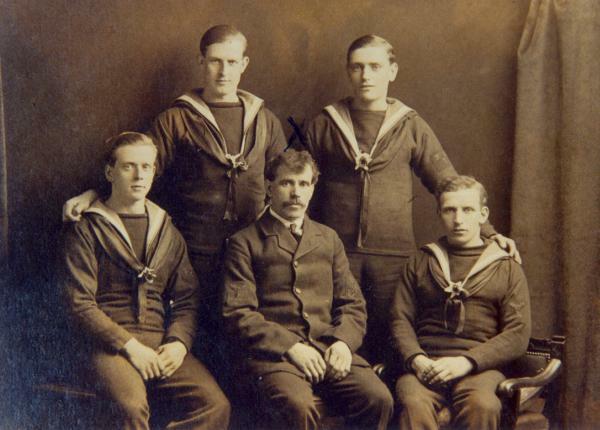 As you can see from this picture, grandfather [The Petty Officer seated] was involved with minesweeping during WWI when many trawlers were seconded for this task. On his arm you can see the RNR badge with a T for trawlers. Henry Watson was engineer of the Girl Annie of Scarborough. I think the trawler was owned by a Filey family. Picture above: This is a photograph of my Great grandfather Edwin [Ned] Hall on the slipway where the Lifeboat house was built.The Hall family were originally from Newark in Nottinghamshire. 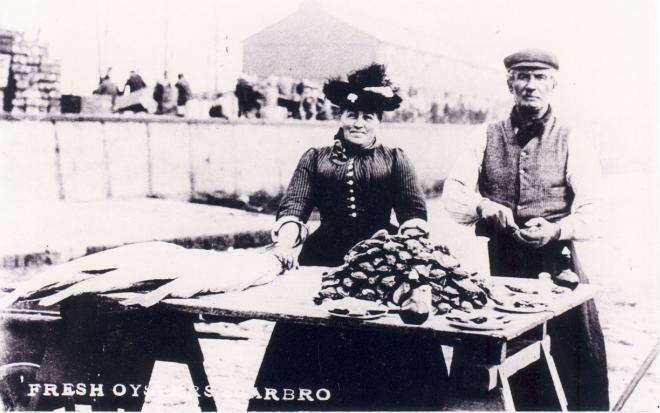 They moved to Scarborough where Ned's father James Hall, who lived a 19 Princess Street, became a Fishmonger. Ned on the other hand fell foul of the Law! He was in fact deported to Australia in 1864 for stealing. Eventually after finishing his sentence, he was granted his Ticket of Leave then Freedom. He returned to England in the 1870's where he married Ellen Cunningham. They lived in the Springfield area, then at 6 Chapmans Yard-Globe Street Scarborough. Picture above: This is a photo of some bottomenders. 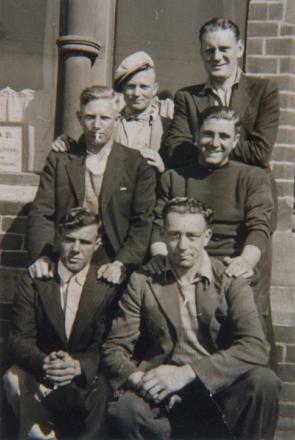 The only person I recognise is my Dad, Frederick Watson [Bottom Left]. Fred who was born in Scarbough in 1914, was briefly in Deep Sea fishing out of Hull, but then joined the Merchant Navy for most of the rest of his life.